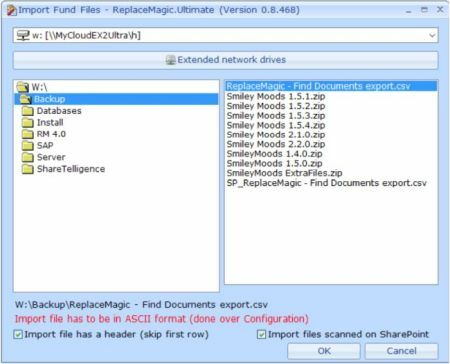 ReplaceMagic extended to support generation of command line parameter file. 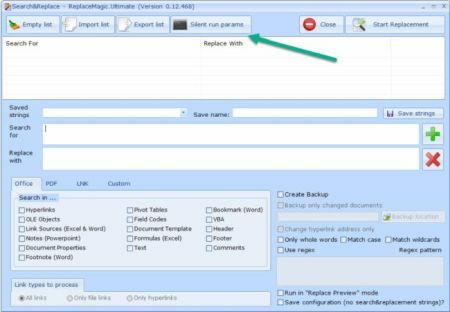 To generate file set everything for replacements (location(s), document type(s) and configuration in Search&Replace form). If you press in Search&Replace button "Silent run params" in newly opened form you will see XML text which can be copied in file where you keep command line parameters. 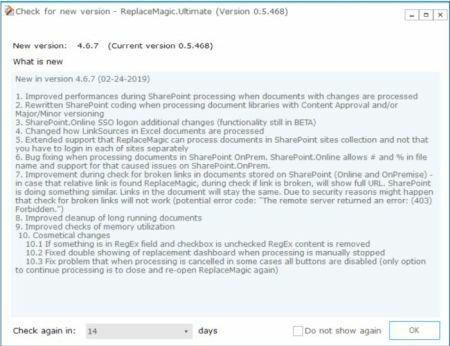 (BETA) Extended that ReplaceMagic can make changes in SharePoint pages content which is stored in SharePoint database (not part of .aspx page). To use this functionality during search&replace go to Search&Replace option and select in Custom tab "Update SharePoint page content (stored in SharePoint database)". 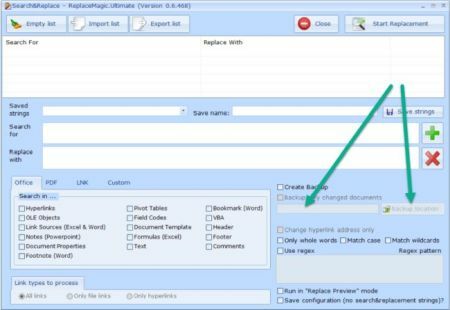 IMPORTANT: Currently, not checked if ReplaceMagic can keep last modified date and editor or approval/publish state or versioning status. 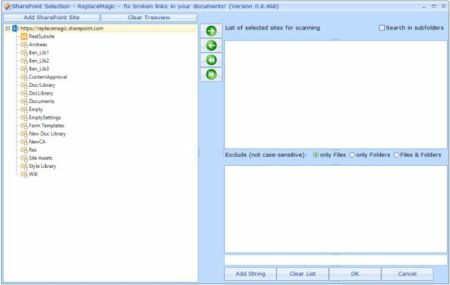 Import: Before you can import SharePoint documents you will need to log to the SharePoint site where documents for import are. 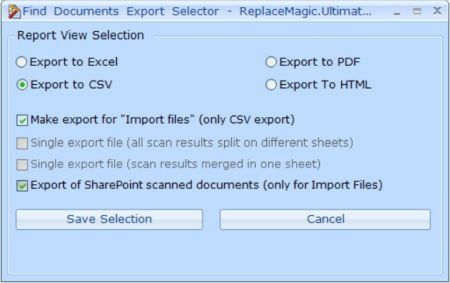 Example, we exported documents stored on "https://replacemagic.sharepoint.com/Shared Documents". 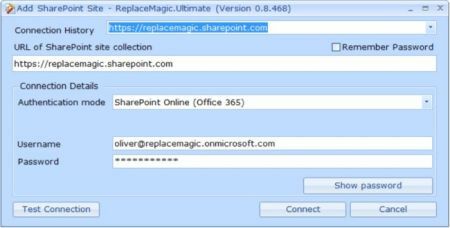 To be able to import and process them it is needed to reconnect to https://replacemagic.sharepoint.com. To do that go to "Add SharePoint site" and connect to https://replacemagic.sharepoint.com. After site is added just click on Ok and proceed with documents import. 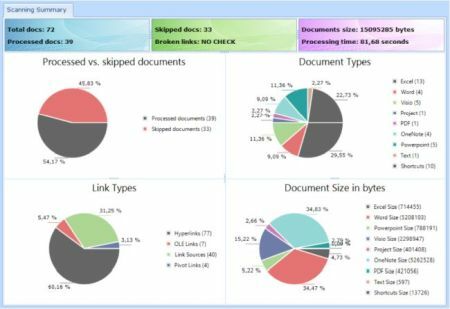 This will create needed for processing of exported SharePoint documents. Not yet tested: if ReplaceMagic can keep Last Modified Date and Editor during replacement process of imported document. Processing flow changed to ensure that flags are kept. In case of Content Approval last modified date and editor can be kept only for documents in Draft version. Documents with other status values will keep status flag but last modified date and editor will be automatically changed by SharePoint after making changes in documents. Added popup to notify user that maintenance period expired including button to send direct email to ReplaceMagic with request for extended maintenance information. From popup you can disable apprieance of this form. After installation of new version ReplaceMagic will reset this setting again. Setting is user specific. Added popup to notify user that there is new ReplaceMagic version available including details about changes in latest version. This popup can be postponed for next 14 or 30 days or completelly disabled. After installation of new version ReplaceMagic will reset this setting again. Setting is user specific.